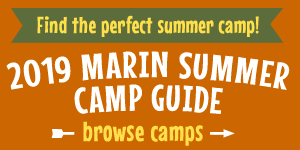 Marin Mommies presents a sponsored article from UC Berkeley's Academic Talent Development Program, which offers summer camps for kids ages 5 to 17 in Point Richmond and on the UC Berkeley campus. Learn more at atdp.berkeley.edu. Is your child curious? Passionate? Looking for a challenge? If so, check out UC Berkeley’s Academic Talent Development Program (ATDP) for summer 2019! ATDP brings together kids from all over the Bay Area and beyond for summer courses in exciting areas like chemistry, programming, art, geometry, writing, and more. Whether your child is a budding physicist, artist, doctor, or author, ATDP will offer unique opportunities to learn. Don’t have a passion quite yet? No problem! Taking a summer course at ATDP is a great opportunity for children to learn more about a subject they already love, or discover a new interest they’re not able to explore during the school year. Our students are guided by engaging, expert teachers who are carefully chosen from a pool of talented public school, private school, and university instructors. In addition to their demonstrated excellence as classroom teachers, they share a serious commitment to rich, deep academic talent development. At ATDP, students meet other kids who are as motivated and interested in learning as they are. They will join a community of learners who choose to grapple with scientific concepts and demonstrate their creative expression, all while having fun! Students finishing grades K to 6 attend courses for three weeks in our Elementary Division (ED). Our Elementary Division courses are held at Washington School at Point Richmond. For our students who are finishing grades 7 to 11, we have six-week courses in the Secondary Division (SD). Our Secondary Division courses are held at UC Berkeley, giving our students the unique chance to sample life on a world-famous university campus. Make summer count by checking out our courses and applying to ATDP for summer 2019!